Spain is one of the neediest countries in Europe as far as the Gospel is concerned. There are over 7,000 towns and villages without evangelical witness. Red Timoteo is proving a vehicle for training a new generation of evangelists who will take the Good News to where it is most desperately needed. The gathering in September focused this time on the context in which the evangelist works, exploring particularly how the evangelist connects, and speaks prophetically, into culture. How does a young Spanish evangelist in the 21st century declare the life transforming Gospel message to a dry land, which is Spain? Please pray for these young evangelists in training. We dare to believe that God will use them to bring change in that land. K180 is pleased to be able to support an EEI collaboration in Spain. RedTimoteo es un programa innovador diseñado para conectar y capacitor a jóvenes en España con un llamado específico a la proclamación public del evangelio. RedTimoteo es para hombres y mujeres entre 18 y 35 años con una passion por la predicación del Evangelio (ya sea en eventos, medios de comunicación, Iglesias, universidades, plazas u otros ambientes). The ‘Timothy Network’ is an innovative programme designed to equip young evangelists who have a specific call for the public proclamation of the Gospel in Spain. The ‘Timothy Network’ is for men and women between 18 and 35 years with a passion for preaching the Gospel (whether at specific events, in the media, churches, universities, parks or other contexts). The training of young evangelists in Spain through the Red Timoteo initiative goes from strength to strength. The need is huge with over 7000 towns and villages across Spain without any evangelical witness. This weekend saw young evangelists exploring what it means to hear the call to preach the gospel and call others to follow Him. It has been encouraging to see this training develop over a few years now and to see three graduates now involved with the leadership team, equipping others for this most urgent task. Another fantastic weekend with a dynamic group of young evangelists. Alongside sharp teaching, it was great to hear some testimonies of how God is using this generation to impact Spain, and beyond, in Jesus' Name. Lolo regularly goes into a local prison to share the message. Last time he was able to give away several bibles donated through Red Timoteo and had the joy of recently seeing 14 men baptised. Another young evangelist has a vision to plant a church in a village where there is presently no gospel witness and has already taken several steps to see this happen, whilst yet another has a burden to move to Myanmar (having already spent some time out there) to reach this predominantly buddhist nation; "I just want to tell them about Jesus". We also had the visit of a Red Timoteo alumni, Danny. Along with another former participant, he is now running similar training in his city for those exploring the call to evangelist. Brilliant! ﻿​With some un-seasonally cold weather (including some snow! ), the next training module took place just outside of Madrid. We had an excellent crowd of young evangelists, several coming for the first time. We also had the joy of seeing 8 evangelists graduate. God is good! We pray that this training will be a solid foundation as each one steps forward in ministry. It was also very moving to hear testimony from one of the alumni, talking of how Red Timoteo put him back on track with God and his calling, his participation coming at a time when his life was spiralling out of control. How precious to see this man of God now flourishing in ministry! ​Another inspiring weekend at Red Timoteo! Young evangelists came together for a weekend of exploring evangelistic ministry in the present Spanish context. It was a particular joy to have our History Makers 'Champion', Saul Valle, joining the teaching team for this particular weekend of training. And also brilliant to have a further two evangelists graduate! Our prayer is that they will always be able to draw on their Red Timoteo experience for a lifetime of preaching Jesus. Interested in knowing more or applying to come on the course ? Please send us your details on the form below and we will be in touch. 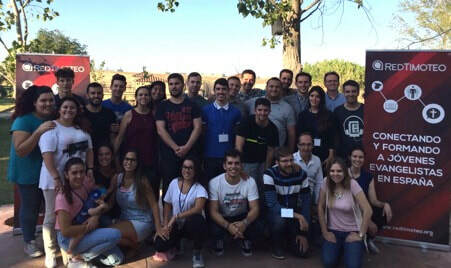 ​April 2016 saw the latest gathering of Spanish young evangelists in training. We were delighted to have the visit of French evangelist Raphael Anzenberger, who took time to invest in these young guys. It was encouraging to sense the hunger of these young evangelists and to hear testimonies as to how their various ministries are developing. Please take a moment to pray for the raising up of evangelists in Spain! Three of the RT graduates were asked to say in one word how they would describe their experience of Red Timoteo. Josue described how since the last residential in March he has started an outreach ministry at his church in Majorca. This ministry sees many believers on the streets week after week sharing Christ with the natives and many tourists there.